These banks are changing for past couple of years. There were a lot of parking spaces here but Prague want to build a few kilometerts long promenade now. 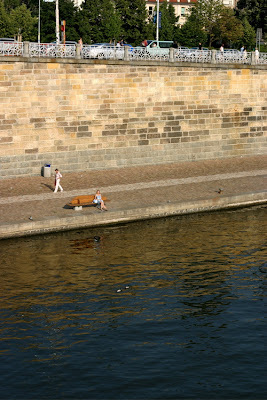 We already have a beach with a small swimming pool on the opposite side of Vltava river. There will be cultural programme on the bank during United Islands of Prague festival this weekend. And so on. This is at Palackeho square (taken from Palackeho bridge) and there's an old fashioned fish restaurant nearby, just at the river. Highly recommended.